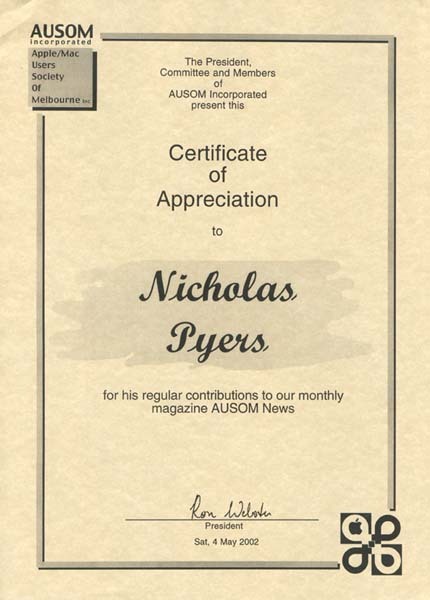 AUSOM, Australia’s Leading Apple Macintosh User Group, presented Nicholas with a Certificate of Appreciation in May 2002 for his regular contributions of articles to their monthly magazine, AUSOM News. Appreciate it! Please keep producing the high-quality materials you do. They are a real asset to the community. First off, wanted to thank you for sharing so many of your articles on the [MUGCenter] Newsletter Content email list. Always interesting, and especially interesting to see the view of things from a much different perspective. There’s also a nice article about calendar sharing written by Nicholas Pyers (from the Aussie mac user group AUSOM).